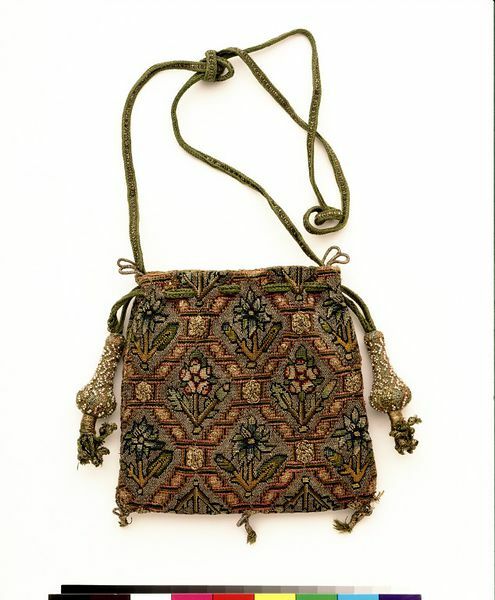 In the 17th century, decorative purses such as this own were rarely used to carry money. Their wealthy owners engaged in few commercial exchanges requiring cash. In addition to serving as 'sweet bags' or 'gift wrapping', purses sometimes contained mirrors for grooming. Others functioned as sewing kits, holding needles, thread and tiny scissors. The purse is made of fine linen canvas and decorated with cross, plait and Gobelin stitches in coloured silk and silver thread. Two large, pear-shaped tassels of braided silk hold the ends of the drawstrings. The pattern of twisted and interlaced bands resembles strapwork, a style of decoration that originated in France in the 1530s and became popular throughout Northern Europe by the end of the 16th century. The use of roses and borage flowers, however, is typical of early 17th-century English textile design. 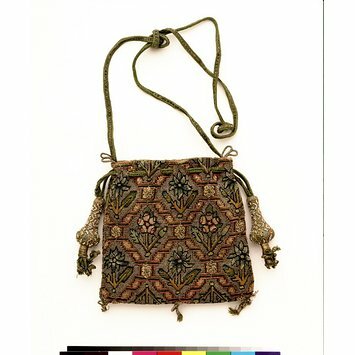 Purse of embroidered canvas with coloured silk, silver and silver-gilt thread and seed pearls. Embroidered with a pattern of flower sprays and a lozenge diaper in tent, cross, plaited gobelin and interlacing stitches, and with knots. The drawstring is of silk braid with large tassels trimmed with pearls. Lined with light brown silk.